Art exhibit features ten pools to represent global pool building community as the height of contemporary design. 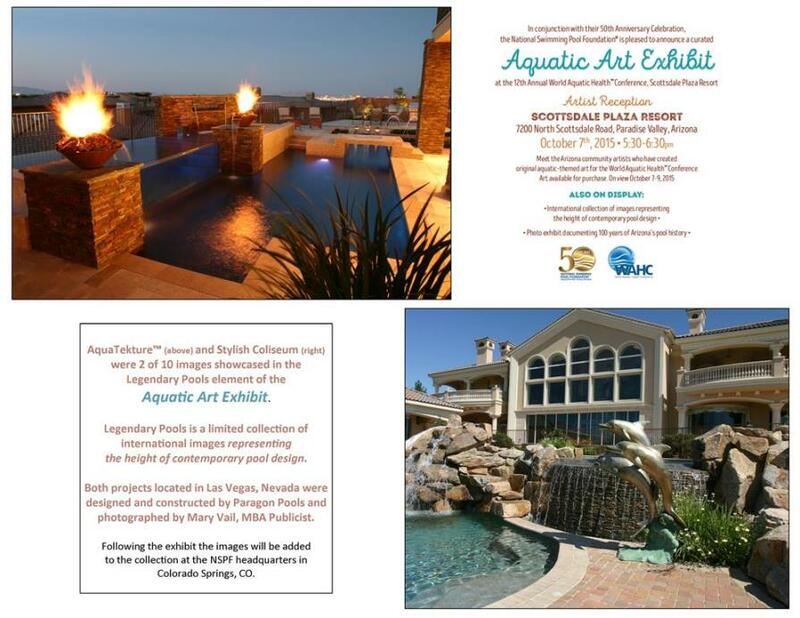 LAS VEGAS - Oct. 19, 2015 - PRLog -- Works by Las Vegas pool contractor Paragon Pools and photographer Mary Vail were featured in an international aquatic themed exhibit as part of the 50th anniversary celebration for the National Swimming Pool Foundation (NSPF) http://www.nspf.org . The NSPF presented the first ever Aquatic Art Exhibit in conjunction with the 12th Annual World Aquatic Health Conference (WAHC) in Scottsdale, Arizona, October 7-9, 2015. The three component special exhibit comprised of; original aquatic-themed artworks by Arizona artists, Legendary Pools by renowned builders from across the globe, and a collection of historic Arizona postcards documenting 100 years of the states’ pool history. The exhibit was curated by Kim Larkin. Legendary Pools is a limited collection of international images representing the height of contemporary pool design. Only 10 photographs were selected for the exhibit from images submitted by swimming pool builders and designers spanning the globe. Two of the ten chosen were designed and constructed by Paragon Pools of Las Vegas http://www.paragonpoolslv.com , and photographed by Mary Vail, MBA Publicist http://www.maryvailpublicist.com . Both pools, Stylish Coliseum and AquaTekture™ are multi-level designs unique to the Paragon Pools’ portfolio. The international award winning pool builder is known for their innovative designs and unique applications. Vail is the exclusive photographer for Paragon Pools. Her pool images are sought after for editorial features, have graced the covers of international publications, and have won numerous awards.